Alice Cooper is a 5 reel, 20 payline slot made in a collaboration with Leander Games and Spike Games. It is a based on the legendary American rocker Alice Cooper. The slot is based on the life and times of Alice Cooper. Alice Cooper (School’s Out For Summer) is a music-themed game featuring a pair of wilds reels, a free spins bonus, a pick a win round and more. You can place your bets from 20p to £80 per spin. Almost all the slots by Leander Games have interesting in-reel features and bonus rounds. Their truest innovations from them come in their gambling games. One such example is Reely Poker which gives you a poker game side-bet, cards on the reels plus a bonus feature. The bonus continues the longer you keep hitting good cards. Reely Roulette stretches the idea even further by combining a roulette game and slot play. The Alice Cooper slot has a great design honouring elements of rock and roll. A snake gaping its mouth open and clouds of fog make up the welcome party to the slot. The reels are set inside a crackling electrical circuit typically seen on an electric chair. The playing cards have lower values and are joined by main symbols that you would see on an Alice Cooper album cover or t-shirt. The best of them pays 200 coins when you land 5 of them on a payline. Fans of Alice Cooper will see a lot of references from her infamous live shows. Some of her most famous songs blast away in the background as you spin. There are also other bonuses offered here. Twin Wilds Bonus feature- This feature begins when the Twin Wilds land on the 2nd and 4th reels simultaneously and at random. The 2nd and 4th reels turn wild and stacked wilds stick in place for a certain number of spins. Death Row Pick A Win feature- This feature is activated when players land 5 School’s Out heart tattoo symbols. When the feature begins there will be 6 switches on screen. Pick on one and an instant win cash reward will be revealed. You can also activate the round when you make it to the end of the free spins gamble trail. Free Spins Bonus feature- If you land 3, 4 or 5 of the boa constrictor bonus icons, you can be able to activate this round. A gamble ladder will then be revealed and players will be rewarded 3 lives. The higher up the ladder you climb, the more free spins you are awarded. Keep an eye out for the special overlay icons you’ll hit during the feature. Extra free spins will also be added to your tally when this happens. The great variety of bonus features on offer here make the game fun and memorable. None of these will be easy to trigger, but if you land all 3 of them have the potential to deliver some decent rewards. The stacked wilds can end up locked in place for several spins. 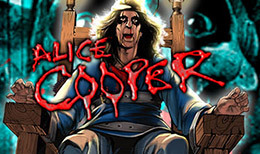 Check out this Alice Cooper slot if you’re looking for a rock and roll theme with great bonuses.